One great benefit of living in a temperate climate with reasonably cold winters is that there is a great selection of trees which produce amazing autumn color. In 1961 Acer rubrum 'October Glory' was first selected and brought to market by the renowned Priceton Nursery of New Jersery. Subsequently it has become one of the most popular specimens to plant for dazzling autumn colour, due to its successful cultivation an easy to grow and maintain nature. 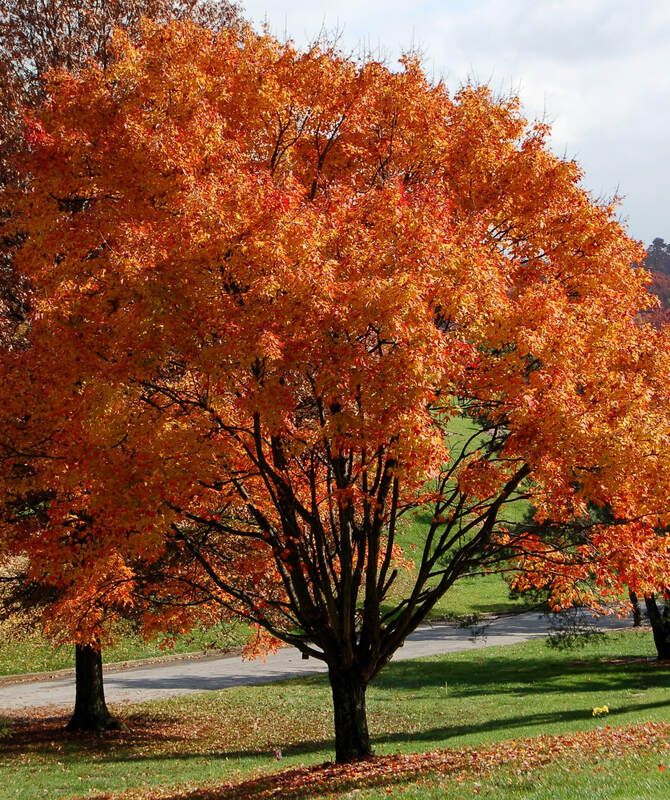 'October Glory' is simply one of the best and most popular maple trees for autumn color. Some trees may rival it but none can excel it in intensity. The color begins as a dark pinkish-red, which over time, shifts to crimson and deep orange producing a brilliant mosaic. The leaves tend to stay on the tree longer than usual making for a prolonged autumn show. 'October Glory' has an upright habit with a good oval-rounded form and will grow to 10-15 meters in height. Its summer foliage is a lustrous dark green and quite handsome and renders it a nice, medium sized 'shade tree' as the Americans would say. This red or Canadian maple is not just a one-season interest tree. In early spring, bright red flowers in dense clusters break out all over the branches before the leaves emerge. The flowers are soon followed by the equally colorful seeds or samaras making it a good habitat for wildlife. It's suitable as a specimen tree, a street tree or even lining a drive where a long row of them would be very dramatic. It's even suitable as a Bonsai subject if you have the skill and patience. 'October Glory' is at its best in reasonably moist soils as it does not enjoy periods of extended drought. Its tough, well capable to withstand the worst of our winters and requires very liottle maintenance once established.